I wanted to make sure I write down the process I've been using with Keira so for my next baby, I can look back and use it as a reference. 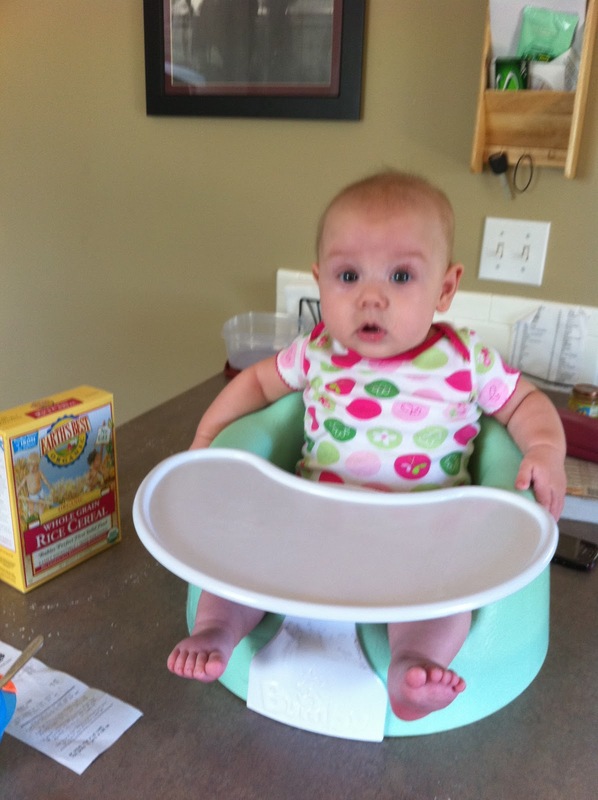 I will admit, introducing solids has made me a little nervous. Every time I feed Keira, I'm so scared she's going to have some crazy allergic reaction and not be able to breathe or she's going to choke and I'm not going to know what to do. I make sure to mush, mush, mush up what I'm feeding her really good, but there's still a little part of me that gets nervous. Especially with all of Pete's allergies...I think that's why I've been so cautious. I'm ready, let's do this eating thing! 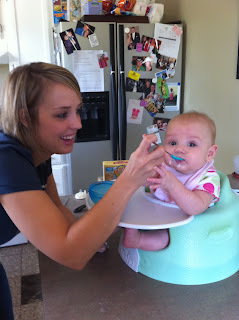 Anyways, the eating has been going very well and Keira is loving solids. I started with the rice cereal and then introduced bananas and then avocado. At first Keira HATED avocado (she gagged a few times while I was giving it to her). My mom suggested adding some cereal and breastmilk to it to soften the taste and that helped a ton. 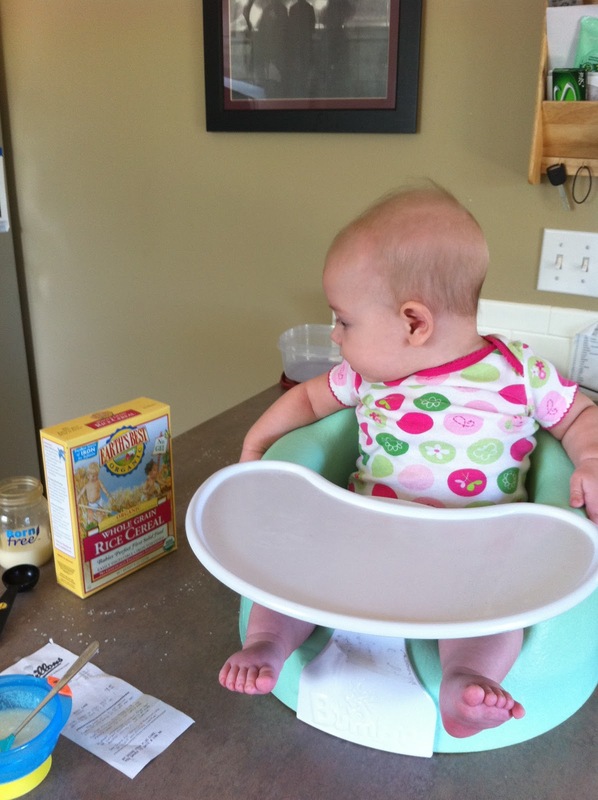 She now loves it and gobbles it up every time I feed it to her! What kind of mom am I?? * Organic Mom - I see this mom as the mom who buys all organic food, organic bedding and clothes, cloth diapers, has a super tight reign on what her kids are doing, when they are doing it, who they are friends with, what they eat, carries hand sanitizer for anyone who wants to touch her baby...basically a mom who is super, super intentional about anything and everything that has to do with parenting and raising her kids in the "right" way and making sure that they aren't subject to any "germs" so to say. * Relaxed Mom - This mom is the one who is parenting in the way that she lives her own life - super relaxed. Not super strict, no schedule, when the baby naps (IF the baby naps) is different everyday. No set bedtime and her schedule didn't change one bit when the baby was born. She carts the baby around to and from whatever she has to do that day. The baby fits into HER schedule, not the other way around. Super, super flexible. * Schedule Mom - Schedule, schedule, schedule....down to the minute. This mom has her baby tired at the exact minute every day and in bed in the exact same position. Eating is all planned out and thought through very strategically. Waketime is intentional and not overstimulating. Babies schedule is first and the mom works around nap time(s). * Do-It-Yourself Mom - This is the mom who doesn't buy anything new and makes all the baby clothing and bedding and blankets and toys. Her lifelong dream has been to be a homemaker and a homecooked dinner is on the table every evening. It's been an interesting process to watch myself parent and learn how I do things. It's funny because before I was a parent myself, I would look at the things that I saw other moms doing and often times be like "Are you kidding me?!?! Ease up!!" or "Seriously, you baby has to be exposed to germs at some point. That's why they are always sick!" Now that I'm there myself...I find myself doing some of the things that I would get so annoyed by before parenting. For instance...if I had to put myself into one of the categories above, I would probably place myself in the scheduled mom category. I am a HUGE fan of routine and schedules and predictability. This has been a major adjustment and at the beginning was extremely hard for me. 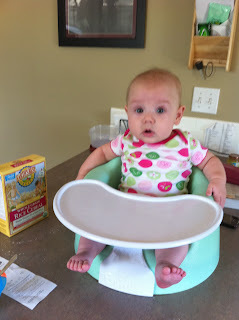 Keira didn't always sleep when I wanted her to or eat when she needed to which would throw me off. It was frustrating and took me a few months to ease up. This is kinda OCD and I fully admit this, but I keep track of (and have been since she was 6 weeks old) everything Keira does on my phone using an app called "Total Baby". Everything from diapers (wet, poopy, what kind of poop), sleep schedule, eating schedule (what side, all her solids she eats, bottles), baths, medicine, vitamins, doctor's appointments, growth, vaccines. It's kinda ridiculous....I am fully aware of that. :) Regardless...it's my brain. Since not every day is the same (to an extent), I'm so dependent on watching my phone. Anyways, all this to say, some of the things I'm now doing as a parent myself have surprised me. I am a super intentional person and while I don't fall into the "organic" category... I do think about almost everything that has to do with or happens to Keira and how it's going to effect her now and in the future. I try to be intentional with the way that I talk to her and interact with her and intentional in the ways that I pray for and with her. Before she was born I read anything and everything about what was happening to her and how she was growing. When she's approaching a new stage, I research it to a large extent and learn everything I can about how to do it right and the most effectively. So these were just a few of the thoughts running through my head this morning. 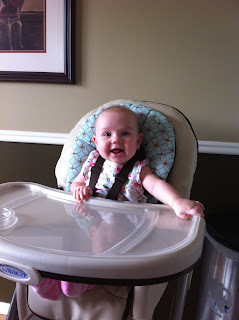 Keira is growing like a WEED (especially since she started eating solids....I feel like she's gained like 10 pounds!) haha. She is SUCH a JOY these days and her laughs and kisses and giggles make me fall more in love with this little girl than I ever, ever could have imagined. It's the deepest, most intense love (besides my husband) that I've experienced. I guess when I reread through this before I hit the post button, the question that came to mind is not what kind of mom am I but what kind of mom does GOD want me to be? He has given us the gift of Keira Blair and how can I parent her in the way that God desires her to be raised? Something to think about I suppose. Anyways...those are the thoughts going through my head. God help me to raise this little girl in a way that honors you and may she grow up to have a kind, gentle, loving spirit. May she come to know you at a young age and may her heart always seek to know you more. Thank you for the blessing of my sweet, sweet baby girl! !